Hope you were able to enjoy the blog hop over at Sparkle n Sprinkle this week. I got the idea for this card from Jackie's post. I also got the idea for the image on the dictionary print from Pinterest. I ended up printing out the dictionary page on Neenah, then imported the Hydrangea Digital stamp from Beccy Muir and printed it over the dictionary page. Then colored with my Copics. I used some Purple Potion Velvet Microfine Glitter from Sparkle N Sprinkle and added it to the flowers. 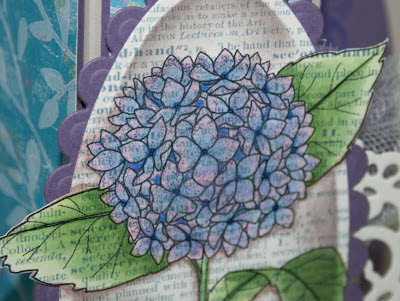 The side panels and the sentiment comes from the Vintage Boutique Stamp Set and embossed with Concord Embossing Powder. The doily is from Lifestyle. I am real happy with the way the image came out with the print behind it. This is amazing looking. Love how you see the print behind the image too. Beautiful design. Such a lovely card! I love the fold and all the elements! Hi, Jill - looks fabulous! 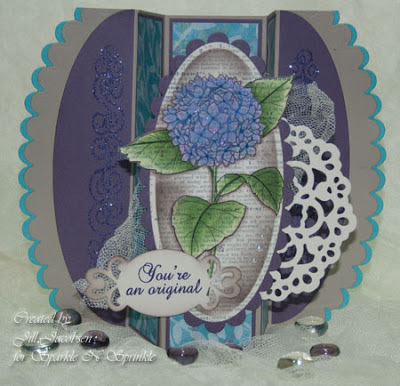 Thanks for explaining the steps you used - and for sharing your wonderful card! Beautiful card! Love the colors and the image is awesome! This is so lovely and the inked die cut behind the image really helps your lovely coloring stand out. Hydrangea are my favorite flowers.